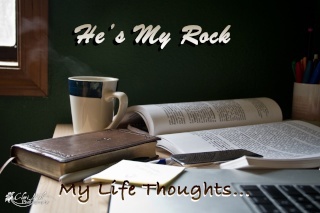 He's My Rock: God opposed to you? 10 And the God of all grace, who called you to his eternal glory in Christ, after you have suffered a little while, will himself restore you and make you strong, firm and steadfast. 11 To him be the power for ever and ever. Amen"
That passage has taught me soooo much. God is so so so so sooo good! At ladies bible study at my church, we've been going through 1 Peter, and I was absolutely elated when we reached this passage! Today we went over verse 5. "All of you, clothe yourselves with humility toward one another, because, "God oppoes the proud but gives grace to the humble."" Wow. God opposes the proud. That's...wow...that's more then enough reason to be humble! When we are prideful, when we are in our sin and unrepentant, God is opposed to us! Yes, I know I'm using lot of exclamation points...but this is HUGE! Do you want the God of all creation to be opposed to you?! I should hope not. We are called to clothe ourselves in humility. To be like-minded with other believers. To serve Christ. Called to be like Christ, who humbled himself to a servant (Philippians 2). 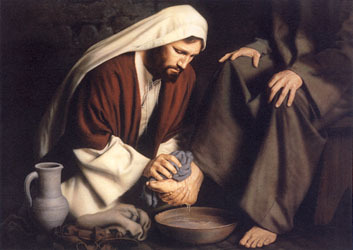 He washed His disciples feet, He sat at the table of sinners. There was no pride in Him. We are called not.to.be.prideful but to be humble. To humbly come before a truly awesome God who has given us way more than we deserve. Humbly come before Him and serve Him in everything you do. My prayer is that I will continually be coming humbly before God, that I will clothe myself in humility and repent of any pride and sin in my life. That I will become a servant of Christ. My prayer is that this will be your prayer to. I only talked about the first part of the verse, I know-but I would be here typing for hours if I wanted to go into the whole thing. Just read it, study it, there are some amazing words in there!